Yes, after all these years, we got together again. It just started with Facebook, really. We figured that the next time we were in Florida we would try to connect. I went from Delray to Miami to visit Mary; Rosarito was coming from Puerto Rico. It really was no problem catching up. It was like time had stood still. We all had had families and gone in different directions. Some of us moved from the Island and made our homes in the States. I have lived in Delaware longer than I ever lived in Puerto Rico and Mary has lived in Florida longer than she ever lived in Puerto Rico and Cuba. Rosarito and her husband have the travelling bug, so they are all over the place. I grew up with these women in Puerto Rico; our neighborhood was so close to the center of the town; we walked everywhere. In younger days, we would ride bikes, rollerblade, read comic books and go to dances at San Antonio Abad. San Antonio was the boys’ school at the time. Those are the memories that are never forgotten. So after I got to Mary’s house we started with the traditional Cuban coffee. We chatted and after some time we decided to take our conversation to a Cuban restaurant called Molina’s. This restaurant is located on 11995 S.W. 26th St. in Coral Way. Telephone is 305-207-8600. We got a nice quiet corner table and ordered some mariquitas. These are made out of plantains, shaved lengthwise and then deep fried. A dip of oilive oil, garlic and spices was served, as well. For lunch we had the traditional Cuban Sandwich and the Media Noches (Midnights). Molina’s has great shakes made out of fresh fruit like papaya. We really had a nice lunch, finishing it with more Cuban coffee. That was a good idea because I was about to get on the turnpike at 4:00 p.m. and if you have ever been in South Florida at rush hour, you know that you better have a good dose of patience. My husband wanted pasteles. These are a traditional Puertorican dish made with mashed plantain and other root vegetables with a filling of pork, ham, chickpeas, raisins, and olives. 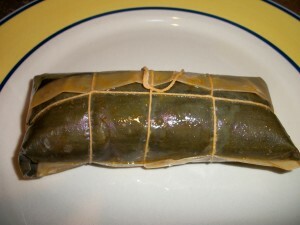 The mashed vegetables are spread on a banana leaf and then the filling is placed on top. It is wrapped and tied with a string. It looks like a “package”. It is boiled and then unwrapped on a plate. Very good. Just like in the picture. Sooo, off we go in search of the pasteles to Benny’s. This Puertorican restaurant is located on 2500 S.W. 107., #1, Miami, FL. Tel. 305-227-1232. Website is www.bennyseafood.com and the e-mail is bennyseafood@gmail.com. It is as the Time Center just a few minutes from Florida International University. I got a dozen of the pasteles and we took off. What I did not know was that this restaurant can ship FedEx all over the United States and besides the pasteles they have Sorullos de Maiz that are a pseudo hush puppy, and morcillas among other Puertorican dishes. Morcillas are blood sausages. Please don’t gag, they are very good. What can I say? It’s the truth!! One of their specialties is the Mofongo which is fried plantain, mashed with garlic, pork rinds, salt and olive oil. Some times bacon is added as well. It is served in a small mortar and depending on the restaurant, it will be served as a side dish or filled with seafood, meat, “salmorejo de jueyes” (land crab made with a creole type sauce). This restaurant is well known. It was featured in the Food Network’s Diners, Drive ins and Dives with Guy Fieri. He is the one with the spiky blond hair that goes into all kinds of restaurants trying everything he can. What a nice day!!! Soon I will be meeting Cuca, up north. 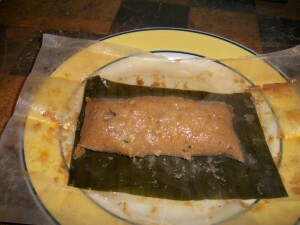 Note: We had 6 of the pasteles and I can tell you that everyone was very pleased. In Delray Beach, Florida….You will Find….Ziree Thai and Sushi…. It was so nice to go back to Ziree Monday night. I have not been back in Delray for some time, but this is a restaurant that we go to every time we are in town. We have been so happy to see it thrive in this community. You find a lot of the local people here and it is probably because their children have been in the local schools. You know how that is, word of mouth is a powerful advertising tool. Ziree Thai and Sushi is located on 401 West Atlantic Ave., near the tennis stadium. The telephone is 561-276-6549, fax number is 561-276-6540. The website is www.zireethai.com. On Monday night both sisters were cooking. After all, this is a family operated restaurant. One at the sushi bar and the other in the kitchen. For a Monday, it was pretty busy. As you come into the restaurant you will notice high ceilings and flowers; the setting has an elegant Zen atmosphere. Comfortable and relaxing. We brought our own soy sauce, wheat free, because of my husband’s gluten allergy. You never know which restaurant will carry the Tamari brand. They did not have it so we gave it to the kitchen to be used on his dish. The menu was full of interesting dishes and usually there is a board at the entrance of the restaurant with the daily specials. You can visit their website and check out their menu. I have had in the past the Ziree salad and I loved it. So, I got a little worried when I did not see it on the menu, but I asked for it and Ziree made it. It had tuna, strawberries and greens in a light dressing that had just the right amount of heat. For my dinner I had the Tsunami Roll, which had shrimp tempura, BBQ eel, cucumber, avocado, scallions, spicy sauce, masago, Japanese mayo, topped with tuna tataki, tempura flakes and eel sauce. It was quite a roll. Great!! My husband had for an appetizer the eel sushi and for his dinner he had fried rice with squid. I know, I know, I cannot imagine what you must be thinking, but if you have not tried squid, you wouldn’t know how delicate the flavor is. Try it next time. Anyway, we enjoyed our dinner. It was just the 2 of us and we ate a little later than usual. We chatted some with Ziree and then said our goodbyes. Note: There is free parking in the back of the restaurant. We did not have any trouble on Monday. Ingredients can be substituted or added upon request. They can alter the hot and the spicy. Take out is available. Just give them a call. And, gift cards are available, as well. Ziree serves lunch and dinner and reservations are accepted but not necessary. Comments Off on In Delray Beach, Florida….You will Find….Ziree Thai and Sushi…. Last year I saw this restaurant open up in Delray, right in the middle of Atlantic Ave.; where the action is. At first I was not sure what was going to happen in that corner. I don’t know, it seemed that the previous establishments did not last long. Well, this restaurant is always crowded. During the summer they have had great dinner specials and if you want to start your week right, then this might be the place to go. You may be able to get 50% off selected bottles of wines. Believe me, they really have wines. They have an Enoteca. And, what is that? It is simply a wine cellar. You will be able to see their selections, menus, galleries, among other things in their website which is www.vicandangelos.com. 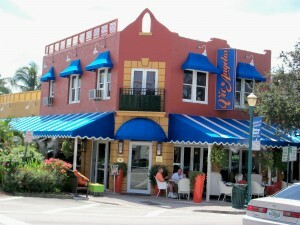 This restaurant is located on 290 East Atlantic Ave., in Delray Beach. Their telephone is 561-278-9570. You cannot miss the location of the restaurant. The colors are very attractive. I think the picture above shows a little of the look but in order to appreciate it, you should eat there sometime. Outside dining is great because you feel you are in a living room with comfortable chairs. The inside dining is air conditioned even though their bar is open to the outside. It is very attractive and you can see the Enoteca from a lot of the tables. It gives it quite an ambiance. We had just arrived from up north, so we sat inside since it was a little humid. Excuse me, that was an understatement. It was hot. But when they presented us the bread at the table, forget the heat; this bread was amazing. They do not make it in-house but they really improve it. Garlic cloves, olive oil, crusty parmesan cheese and warm bread. Priceless!! We ordered their chicken wings because people talk about them. They are grilled but the meat falls off the bones. Very good. Then, of course, we ordered a calamari appetizer; it is not real Italian unless you order some calamari. They were grilled with a bit of sauce. Molto bene!! I have a friend, whose father, every time they go to an Italian restaurant asks: “who wants some calamari?”. So I am mentioning this on his behalf. My husband had the Gorgonzola wedge and I must say that they were very attentive to his gluten allergy, so their awareness was refreshing. We had salads, because it was what the weather called for. My Ceasar salad had the white anchovies and that brought this salad up a notch. As happy hour approaches the restaurant gets hopping. I think Vic & Angelo’s has those 5 ingredients that I have mentioned before make a restaurant. These are: Quality of the ingredients – if the restaurant has money then it should buy the best, culinary competence – it is the chef’s responsibility, service – prompt, anticipating what is needed, ambiance – tranquil and relaxing and the last one is price – reasonable for the food you get. What really ended this lunch on the right note, was that when I presented my license, since I always put on my credit card “see I.D.”, the waiter said that he had a soft spot in his heart for Delaware because he had lived in Bethany Beach for several years. And, I knew he was not making this up because he knew Rt. 26 very well. It was nice. We left the restaurant with smiles on our faces. In one of my last posts I mentioned that I would probably be visiting Delray Beach soon. Well, I am here with my husband, but we actually visit Delray quite often. I would put it in the same category as one of my beaches. Years ago, while visiting Florida, Marilyn told me to stay in Delray Beach because the town had gone through a revival and it was quite charming. Well, we really enjoyed it and it reminded us of home; coastal towns with everything the beaches have to offer. The beach in Delray is great. No building obstructions of any kind. Only the palm trees and the sea grapes. The town is known for the abundance of sea grapes. They use them in landscaping because they grow so fast and can create a great hedge. Today I was walking and just picked some of them from a hedge. They are at the height of the season, but a lot of people don’t know that you can eat them. They are sweet and tart at the same time and have a small pit. The best ones are the purple ones. My neighbor, Felix, takes a walk everyday and apparently he is finding avocados somewhere but will not divulge the location. He said that they are so good. Well, I am sooo glad for him. Anyway, just here for a few days. It is hot and humid. Thought I would write a bit about this wonderful town they call, A Village By The Sea. Delray Beach is located on the Florida’s Atlantic coast, between Palm Beach and Boca Raton. Two major airports support the many visitors to Delray. One is in West Palm Beach, Palm Beach International and the other in Ft. Lauderdale. From these airports, depending on the traffic it’s about 20 minutes from West Palm and about 40 minutes from Ft. Lauderdale. Delray has maintained its charm through history. The area is known for its rich soil, many different types of crops (pineapple, tomatoes, vegetables, oranges) and the large colony of artists that call this beach town home. There are so many festivals held here and throughout the year. Visitors come to them to enjoy all the festivities around the historic downtown streets. Atlantic Ave. is the main street going East to West and this is where you will find a lot of shops and restaurants. Restaurants are allowed to have seating on the sidewalks so on any given night, at the height of the season, the sidewalks are full of patrons, sometimes accompanied by their pets, enjoying a good dinner under the stars. In some of the old photographs, Atlantic Ave. was lined with Royal Palms, but they were destroyed by the 1947 hurricane, or removed to expand the road once the new bridge was built. An important award was given to Delray Beach in 1993 and in 2001; “All American City” from the National Civic League. It really is a beautiful coastal town; one that has had its ups and downs through its history but has maintained its building and development integrity. If you are fortunate enough to visit sunny Florida this winter, running away from the cold weather up north, visit this town and you might even hit one of those famous festivals Delray Beach is known for. If you are coming to the Delmarva Peninsula this coming week, you will not be bored. So many things to do. Thursday, October 1st. – At the Seaside Nature Center located inside the Cape Henlopen State Park – Lunch and Learn. Noon to 1 p.m. – Wildlife Photography with Gary Cooke. He will give a lesson on capturing wildlife through the lens. His work is featured in Outdoor Delaware and in local art galleries. Bring your lunch to this presentation and they will provide coffee and dessert. The cost is $3.00 but you will need to pre-register, so please call 302-645-6852. Remember that there is still a Park entrance fee until November 30th. Friday – Sunday – October 2, 3 and 4th – Lewes Merchants Fall Sidewalk Sale will start at 10:00 a.m. until 8:00 p.m. For more info. call 302-645-8073 or visit www.leweschamber.com. Friday, October 2nd. – Dolphin Dash 5K Run – This race will be at Shields Elementary School in Lewes, starting at 5:30 p.m. to benefit the school’s parent-teacher organization. For info. call 302-644-8952 or visit the website www.seashorestriders.com. Saturday, October 3rd. – Volunteer Trail Day – 9 a.m. until noon. Join the Friends of Cape Henlopen to give them a hand on the maintenance of the Park’s trails or other light work. Please call 302-644-5005. Meet at the Seaside Nature Center. Saturday, October 3rd. – Driving on the Beach by Surf-Fisherman Joe DiBattista. 9:30 a.m. – 11:00 a.m. The cost is $5.00 and pre-registration is a must. Please call 302-645-6852. Meet at the Seaside Nature Center, inside the Cape Henlopen State Park. Tips on how to drive your surf-fishing vehicle safely on the beach, rules and regulations, how to avoid getting stuck, and how to get out if you do get stuck, will be topics of this presentation. Please note that Park’s fees are still in effect until November 30th. Saturday, October 3rd. – Snakes and Turtles – 2 p.m. – 3 p.m. at the Seaside Nature Center located at the Cape Henlopen State park. $3.00 per person and pre-registration is required. See Delaware’s native reptiles and find out what they are doing during the fall to get ready for the winter. Please call 302-645-6852. Park’s fees are in effect. Saturday, October 3rd. – Hayrides throughout the Park at 6 and 7 p.m. Tickets are on sale at the Seaside Nature Center on Saturday morning on a first come, first served basis. Children must be accompanied by a paying adult. Maximum of 6 tickets per person. Limited to 18. $4/person. Entrance fee to the Park is in effect until 11/30. Saturday, October 3rd. – Lewes Historical Society Craft Fair – 9 a.m. – 4 p.m. Location: Lewes Historic Complex, 110 Shipcarpenter St., Lewes. Rain Date will be Sunday, Oct. 4th. Admission $3.00. Children under 12, free. A very festive fair with live music. For more info. call 302-645-7670 or visit www.historiclewes.org. Saturday, October 3rd. is the 14th Annual Boast the Coast Maritime Festival. There will be activities throughout the day and into the night. The Boast the Coast events in 1812 Park and the City Dock will begin at 11 a.m. The Lighted Boat Parade will be at dusk on the Canal. Boat entries will leave Roosevelt Inlet at 6:30 p.m. and arrive at the City Dock/Fisherman’s Wharf at around 7 p.m. Entries to the boat parade are free. They can be picked up at the Lewes Chamber of Commerce center in the Fisher-Martin House, next to the Zwaanandale Museum or call 302-645-8023 to have one mailed. Free boat tours at the City Dock will begin at 11 a.m. until 3 p.m. There will be also a seafood tasting at 1812 Park. The Family Fun Tent will feature music and a magic show. The Lewes Maritime History Museum located at Cannonball House will be open from 11 until 4 for free tours. Sunday, October 4th – Coast Day – The University of Delaware’s College of Earth, Ocean and Environment, Lewes. Lectures on on-going research and so much more. The theme is “Climate Change and Our Coast”. 11:00 a.m. until 5:00 p.m. Free. For more infom please call 302-832-8083 or 302-645-4346, or visit the website www.decoastday.org. Friday – Sunday, October 2nd – October 4th. – Is the 33rd Annual Fall Sidewalk Sale in the Rehoboth/Dewey Beach area. Shops in downtown Rehoboth and on Rt. 1 will have an abundance of merchandise at clearance prices. If you want more info., please go to www.beach-fun.com. Friday – Sunday, October 2nd – October 4th. – Downtown Rehoboth Oktoberfest 2009 – The restaurants that are participating will have special menus and much more. More info? Visit www.downtownrehoboth.com or call 302-227-2772. It will be a great party atmosphere!! Friday, October 2nd – Tom Jones – Cinema Cabaret and the Rehoboth Film Society, Rehoboth Theater of the Arts and Ovations Restaurant and Lounge are the co-sponsors. You need to be seated by 6:30 p.m. While watching this film you will be able to enjoy a 3 course meal, prepared by Ovations. Admission is $30, which will include meal, coffee or soda and film. Alcohol and gratuity are not included. For reservations please call the Rehoboth Film Society at 302-645-9095, Ext. 1 or Ovations at 302-227-9310. If you need further info., visit www.rehobothfilm.com. Sunday, October 4th will be the 2009 Aids Walk in Rehoboth Beach. The registration will start at around Noon at Grove Park. Walkers will take off at 2:00 p.m. and proceed down Rehoboth Ave. to Scarborough Ave., down Lake Street to Queen Street, and walk the length of the Boardwalk before heading back to Grove Park via Henlopen Ave. For info. call 302-652-6776 or e-mail jklein@aidsdelaware.org. Monday, October 5th – At the Cultured Pearl, Monday Sushi Night is Back starting at 4:30 p.m. Reservations? Call 302-227-8493. For only $10 you get Miso Soup + Edamame + Green Tea + Pick 3 of a choice of 16 rolls. This year you can stubstitute their most popular roll, the Firecracker, for $5.00 more and/or substitute a roll for an order of shrimp or salmon sushi. Those will be the only substitutions available. Last year it was great!! Thursday through Saturday, October 1st – October 3rd. will be the Dewey Beach Music Conference at the Rusty Rudder. Trade show, lectures and seminars, featuring speakers, exhibitors, musicians and professionals from every aspect of the music industry. There will be 150 bands at different Dewey Beach venues. Some admission fees. Free evening performances. For more info. call 302-703-2929 or visit www.deweybeachfest.com. Sunday, October 4th. – The Six Annual Celebrity Chefs’ Beach Brunch to benefit the Meals On Wheels Delaware. Tickets are $95/ person and you can purchase tickets on line at www.mealsonwheelsde.org. If you buy 6 tickets, the price per ticket will be $75. Time: 11:00 a.m. until 2:00 p.m. Location: BayFun Center at Ruddertowne. There will be cuisine of top area chefs, beer, wine and spirits, unique silent auction among other things. One of the chefs that caught my attention is Brian Sikora, who is a nationally known chef and the owner of one of the most exclusive restaurants in the U.S., Talula’s Table in Kennett Square, PA. This restaurant limits the size of its restaurant to only one table, for a party of 8 to 12 and reservations are normally made a year in advance. Friday, October 2nd – Family Campfire on the Beach at 130th Street – 6 p.m. Bring your family for an old-fashioned campfire. For more info. visit www.ococean.com. Friday, October 2nd and Saturday, October 3rd. – Winefest On the Beach at the Inlet Parking Lot – Experience Wineries from across the Mid-Atlantic region, arts, crafts, food and live entertainment. 11:00 a.m. until 7:00 p.m. Please visit www.winefest.com. Saturday, October 3rd and Sunday, October 4th. – Ocean City Coin and Currency Show at the Ocean City Convention Ceenter, 40th St. on the Bay. 1:00 a.m. until 6:00 p.m. Website is www.coinbrowser.com. As I mentioned before, the beaches are not sleeping in this Second Season. If anything, they are as busy as ever. Hope you are here to enjoy some of the events. So, until next time. Have a good week. 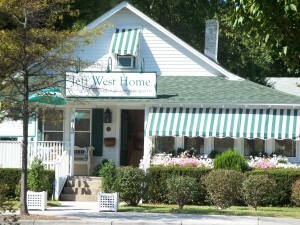 A Must Stop Shop in the Delaware Beaches….Jeff West Home….in Rehoboth Beach, Delaware…. Jeff West Home opened its doors in 2008 in downtown Rehoboth Beach and immediately it has been the store to go for furniture, lamps, accessories, gifts and so much more. The location of Jeff West Home is 413 Rehoboth Ave., Rehoboth Beach, DE 19971. Tel. 302-227-3635 and Fax #302-227-3585. Website is www.jeffwesthome.com and e-mail address is jwest@jeffwesthome.com. Years ago, Jeff West’s career started; first with The May Company and then with The Kellog Collection in Washington, D.C.
His interior designing is kown in several major cities, but I did not have to tell you this because the moment you step into this charming “cottage” on Rehoboth Ave., you really can feel that this person has a passion for timeless and traditional touches. As you come in, Jeff is right there to greet you and immediately you cannot wait to see it all. The colors are crisp and welcoming. In the shop you will find furniture, sofas, lamps, wall brackets, candles, wrapping paper and gift tags. Custom bedding is available by special order, as some of the pieces of furniture. The rugs by Dash and Albert are of various colors, patterns and sizes. Perfect for coastal living. Just placed in the right places you will find, frames, hurricane lamps, and painted side tables. So many pieces to discover in this shop. The embroidered pillows; great colors and designs. Sometimes that is the additional touch needed to finish the look. One section of the store that caught my eye because it was so cute was the Children’s Corner. In it you will find tables, just the perfect size for a child, and even a chaise that could also be used by a pet. There were small needlepoint pillows and also in needlepoint, a brick doorstop. For the newborn he had just gotten in the tiniest needlepoint slippers. The children’s clothing was Classic Collection from Little English “Inspired by Memories”. You would think that this shop is probably huge with all the different selections, but it is really a small shop. It is an art, to be able to display so much in a small shop and keep it fresh. Jeff has a line of home fragrances but he told me that a new line is about to arrive soon to be added to his existing line. Going to the beach, boating, or sitting by the pool? Don’t worry because Jeff West Home has a fun line of frosted plastic cups and cocktail napkins by Fine Whines. All in all, I had such a good time going through everything in the store. You should visit the above mentioned website, because it has so much more information than what I am able to tell you. But, better yet, visit the shop. Jeff is always there. Remember that soon enough, the holidays will be upon us and Jeff told me that he has great things coming soon for that most festive time of the year. At the moment, some of his Halloween items are on display and they are funny. Note: Jeff West offers designing services. Consultations are on a fee basis. Folk Artist Natalie Silitch – Made by hand in Annapolis, Maryland, Natalie Silitch makes fabric angels and folk art figures of hand-painted crackled canvas. For many years, Ann had a store on Rehoboth Avenue. One of those stores that are a “must stop shops” as I call them. Even if you did not need anything, you would stop because her store showed her classic clean lines and unique accessories for the home. Pleasant to the eyes. As our children grow, other priorities come into our lives and you want to be able to be there for them, to go to their games, carpools, etc. And, that is what Ann has done. Instead of having a store, where you would have to be there everyday, Ann has been able to keep her hands in the business, so to speak. So, in 2008 she launched her next venture. Her new business is still Ann Bateman, Ltd., located on 413 Rehoboth Ave., Rehoboth Beach, DE 19971. Her telephone is 302-226-0747, Fax #302-226-0759. Her website is www.annbatemanltd.com. The website is under construction at the moment; soon it will be up and running. Her e-mail address is annbatemanltd@verizon.net. He shop specializes in custom stationery and personalized gifts. She is on the top floor of the building occupied by Jeff West Home, as well. It is a nice cozy enviornment, where she has been able to display a sample of the services she has to offer including personalized plates, placemats and bags; so important for our casual living, here at my beach towns. An important part of her business in invitations. We all need those, whether we are having a party, small or large, or for those important events like weddings, anniversaries and birthdays. She will be able to sit with you on a quiet setting and choose the perfect invitation or stationery that will suit your needs. Definitely, a unique addition to the Delaware Beaches. Note: Ann Bateman, Ltd. is open on Saturdays or by appointment, so please give Ann a call to the above mentioned telephone number or send her an e-mail. 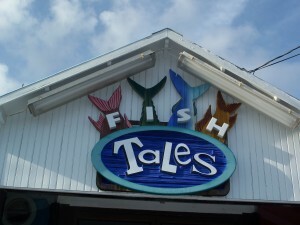 In the Delaware Beaches, in the town of Bethany Beach, Delaware….You will find Fish Tales…. Now when you read the title for this post, did you know what I was talking about? But, no, wait a minute, how could I ask such a thing, when for many years this store has been part of the Bethany Beach community? I know Bethany Beach well. I lived there from 1981 until 2000. I have seen many changes in this beach town. I remember when you pretty much knew everyone; from the policemen to the guys picking up the trash. Going to the Post Office was a big event, especially, after the summer season. A get together. And, yes, Bethany mourns, weeps and buries the passing of the summer in a traditional Louisiana, Jazz style funeral, started by the community of merchants so long ago. Part of the charm of Bethany Beach is Garfield Parkway. Pretty much, it is the heart of the town. This street has shops on both sides of the street, restaurants, ice cream shops, popcorn, and French fries as well. The merchants are known to come out to the front sidewalks and chat with one another. One of these merchants is Diane Ternahan. She and her husband, Bob, are the owners of Fish Tales, located on 107 Garfield Parkway. Tel. is 302-539-7676. I stopped there the other day, late in the day, almost at closing and even though I had not seen Diane in a long time, it did not matter, we started catching up and it was very nice to see her. The team that keeps Fish Tales going is Debbie and Renee and they were there as well. I was telling all of them about the blog and I decided then and there that I would talk about Fish Tales. The store is one of my must stop shops in Bethany Beach. From the outside, it is deceiving because when you go inside, it is quite long. They have a complete line of Fresh Produce apparel as well as the very popular Life is Good. There are plenty of giftware, for birthdays, anniversaries, and hostess gifts. Souvenirs with the name of Bethany Beach are in abundance. And, what is summer without flip flops? Do not despair, they have them in all sizes, colors and brands. Fish Tales even has a Toy Dept. so, even your little ones would want to come in. And, not only do they have the Toy Dept. but you can get accessories for the home or cottage like table lamps, frames, etc. Something for everyone. You can get pretty comfortable inside Fish Tales; comfortable enough that you will forget that they are locking the store for the night. This is not the only store Diane owns and operates. She is a busy woman but lucky with enough employees and family to help her run 3 stores. Yes, besides Fish Tales she owns Arnie’s Playland (arcade) and Rhodes 5 & 10. Rhodes 5 & 10 was owned by Diane’s father, Arnie Rhodes. It is the original 5 & 10 of the 1960’s. Too bad Mr. Rhodes had gone South, to Delray Beach, Florida. Otherwise, I would have loved to have seen him. Comments Off on In the Delaware Beaches, in the town of Bethany Beach, Delaware….You will find Fish Tales….